Here are two USA made GE T8s, the top manufactured by LEDVANCE (Osram Sylvania), and the bottom a true General Electric. The top lamp has an Osram-style date code and end caps, and GE meatball isn't perfect. The F24T8 lamps (aka F24"T8 or F18T8), used to be made by General Electric in Hungary, and were made by GE in the U.S. before that. Maybe they were produced in Indonesia for a short time before being outsourced to LEDVANCE, though I haven't seen one. 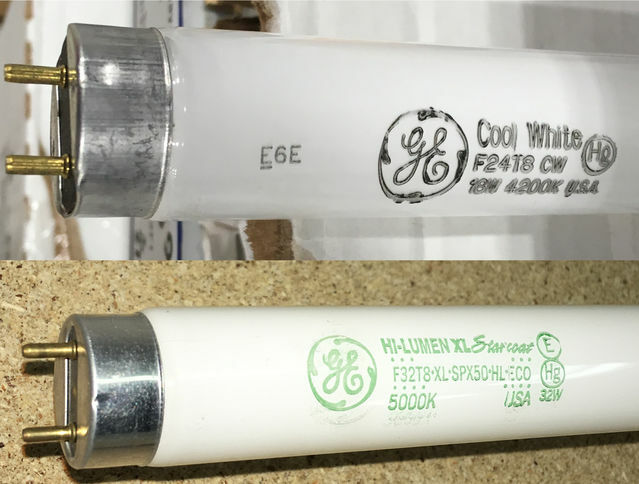 I have 3 Indonesian made GE 18w F24T8 lamps, i have not posted images yet but i can if anyone's interested. The GE F24T8 is now made in China. I also have one made in Indonesia. They were actually pretty good unlike the Indonesian made F15T8s, due to beefier electrodes.